The Turkish lira sank 13.7% in chaotic Friday trading. The lira's 21.0% "worst week in 17 years" collapse pushed y-t-d losses to 41.1%. Turkish 10-year yields spiked to almost 21%, before retreating somewhat. 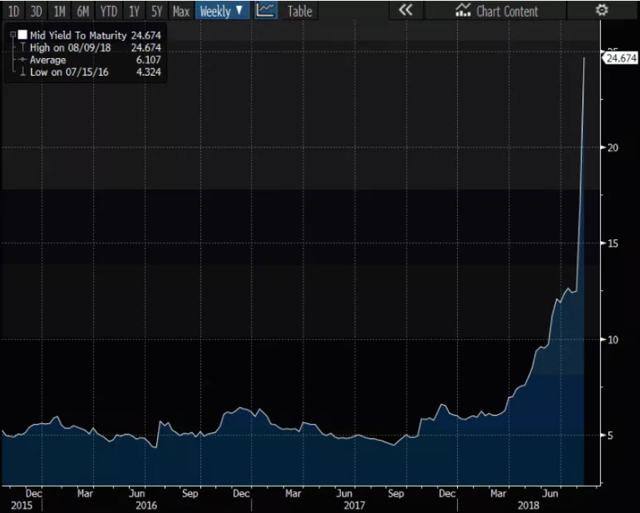 After beginning the year at 155, Turkey sovereign credit default swaps (CDS) spiked 166 bps during Friday trading (up 199 bps for the week) to 437 bps (high since Feb. 2009). EM Contagion Effects gained momentum this week. Friday trading saw the Argentine peso hit 3.8% and the South African rand sink 2.7%. For the week, the Argentine peso fell 6.6%, the South African rand 5.5%, the Brazilian real 4.0%, the Hungarian forint 2.2%, the Romanian leu 2.1%, the Polish zloty 2.2% and the Mexican peso 1.8%. On the (local) bond yield front, 10-year yields in Brazil jumped 66 bps, Russia 40 bps, Hungary 15 bps and South Africa 13 bps. As global "hot money" frets faltering liquidity and the next shoe to drop, Brazilian equities sank 5.9% (as Brazil sovereign CDS jumped 24 bps to 237 bps). August 10 - Bloomberg (Lionel Laurent): "Turkish President Recep Tayyip Erdogan has been standing firm as investors dump his country's assets at an alarming pace, saying: 'They have got dollars, we have got our people, our right, our Allah.' European banks with substantial investments in Turkey will hope some of that divine providence rubs off on them, too, after sticking with a bet that has gotten more perilous over time." Fears of contagion this week were not limited to the emerging markets. With significant exposure to Turkey, European bank stocks were slammed in Friday trading. Unicredit sank 4.7% and ING Groep fell 4.3%. The big German banks, Deutsche Bank and Commerzbank, dropped 4.1% and 3.5%. European Banks (STOXX600) fell 1.9% Friday. August 10 - Financial Times (Claire Jones, Ayla Jean Yackley and Martin Arnold): "The eurozone's chief financial watchdog has become concerned about the exposure of some of the currency area's biggest lenders to Turkey - chiefly BBVA, UniCredit and BNP Paribas - in light of the lira's dramatic fall… According to cross-border banking statistics from the Bank for International Settlements, local lenders, including foreign-owned subsidiaries, have dollar claims worth $148bn, up from $36bn in 2006 and euro claims worth $110bn. Spanish banks are owed $83.3bn by Turkish borrowers, French banks are owed $38.4bn and Italian lenders $17bn in a mix of local and foreign currencies. Banks' Turkish subsidiaries tend to lend in local currency." The above FT article was written prior to Friday's currency collapse. As Contagion gathers momentum at the "periphery," the "core" is indicating heightened vulnerability. European fragilities are again rising to the surface. Italy's MIB 35 stock index dropped 2.5% in Friday trading. Germany's DAX fell 2.0%. Safe haven bund buying saw German 10-year yields fall six bps to 0.31%. Italian 10-year yields jumped 9 bps Friday to 2.98%, as the Italian to German 10-year yield spread widened 15 bps. For the week, this spread widened 16 to 268 bps, the widest since the May spike to 290 bps (which was the wide since 2013). Elsewhere in the European "periphery," Greek spreads (to bunds) widened 22 bps (to 387 bps) this week and Portuguese spreads widened nine bps (to 146 bps). August 10 - Financial Times (Daniel Dombey): "Some analysts have long seen Turkey as a 'quantitative easing play' - a country that benefited from developed economies' huge asset purchase schemes. But as US and eurozone quantitative easing becomes history - at least for this economic cycle - the funds that Turkey needs are getting harder to come by. Those funds are far from negligible. An ABN Amro report on Thursday said investors were worried Turkey would not be able to finance its annual external financing requirement of about $218bn - which includes funds needed to maintain Turkish companies' foreign-denominated debt as well as the country's hefty current account deficit." Turkey is the poster child for systems that have for a decade luxuriated in abundant cheap global liquidity. Once again, dysfunctional global finance furnished plentiful rope for economies to hang themselves. A spectacular Turkish borrowing binge fueled a formidable Bubble. A spending boom, ongoing low savings and persistent Current Account Deficits (surpassing 6% this year) have been for years financed with cheap international (chiefly dollar) finance. Turkish corporations have more than doubled foreign-denominated borrowings since the crisis to over $200 billion, approaching 50% of GDP. Turkey now faces funding requirements (current acct deficit and maturing debt) of over $200 billion over the next year in the face of an acute "hot money" exodus. It's untenable. The situation has evolved into a full-fledged crisis of confidence, which typically foreshadows the violent end to a country's existing financial and economic structure. 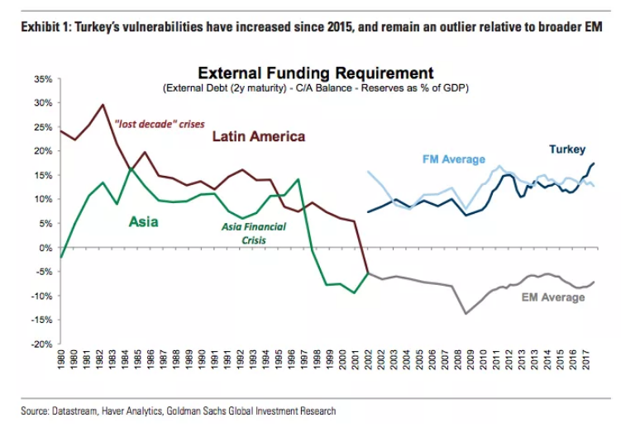 In ways, Turkey's crisis resembles previous bursting EM Bubble episodes: too much cheap international "hot money" financing an unsound boom, replete with excessive spending and malinvestment. The protracted nature of Turkey's Bubble ensured deep structural maladjustment. Today, the Turkish "economic miracle," as many before it, is exposed in harsh terms. The reversal of speculative flows has illuminating latent fragilities and an unsound currency. The banking system and scores of corporate borrowers of dollar-denominated debt are at the brink of insolvency. Suddenly, the whole Bubble is coming crashing down. Similar scenarios recurred in absolute dismal fashion throughout the nineties. August 10 - Xinhua (China's official state-run press agency): "Turkish President Recep Tayyip Erdogan urged on Friday his nation to change all savings in U.S. dollar and gold into Turkish lira. [The] Dollar will not block our way. Let's respond them with our national currency,' Erdogan said in his address to crowds… 'Change your dollars and gold under the mattress to the local currency,' he added. The Turkish president described the campaign as a "national struggle" in response to 'those who declared economic war' against Turkey. Meanwhile, Erdogan ascribed the current 'economic problems' to 'artificial financial instability waves' stoked by foreign actors, rather than structural issues involving employment or the banking system. He also blamed foreign meddling in Turkey's economy because of 'some bilateral disagreements,' hinting at the tension between Turkey and the United States." I fear Erdogan's pinpointing sinister foreign forces behind Turkey's problems will garner adherent elsewhere - with measures from the U.S. administration stoking conspiracy suspicions. Calls for Turks to sell dollars and gold to support the lira recalls South Korean citizens donating their gold to help the government stabilize the Korean won (and service an IMF loan) back in 1997/98. We'll see if Turkey's population can match the extraordinary patriotism demonstrated by the South Koreans - and if they do, whether it will even matter. Typically, market expectations would have Turkey immediately commencing negotiations with the IMF (didn't take Argentina long). Yet these are neither normal times nor is Recep Erdogan a typical head of state. In this age of the strongman leader, bowing to the demands of an institution domiciled in Washington (while backing down to Trump) may be unacceptable in Ankara and throughout Turkey. From the FT (Ayla Jean Yackley and Demetri Sevastopulo): "Mr Erdogan urged Turks to stand firm and defend their currency. 'If there is anyone who has dollars, euros or gold under the pillow, he should go and convert this at the bank,' Mr Erdogan said. He also held talks by telephone with Russian president Vladimir Putin to discuss economic and commercial ties." Putin will lend a sympathetic ear. For some time now, the strongman Russian president has assailed U.S. dominance over global financial and economic institutions and arrangements. Putin's outrage was surely further elevated this week with the imposition of additional U.S. sanctions. August 10 - Politico (Emily Goldberg): "Russian Prime Minister Dmitry Medvedev warned Friday that his nation could retaliate against the United States' newly issued economic sanctions, saying it would consider any action against its banks an act of economic war. 'I would not like to comment on talks about future sanctions, but I can say one thing: If some ban on banks' operations or on their use of one or another currency follows, it would be possible to clearly call it a declaration of economic war… And it would be necessary, it would be needed to react to this war economically, politically, or, if needed, by other means. And our American friends need to understand this…'"
The Russian ruble declined 1.4% Friday and was down 6.4% for the week (down 14.8% y-t-d). Russian 10-year (ruble) yields increased eight bps Friday and surged 40 bps for the week to the high since December 2016. Russian dollar-denominated yields jumped 32 bps this week to multi-year highs (5.14%). Moscow must be feeling under assault - and increasingly bereft of patience. To have the strongmen of Turkey and Russia speaking the same language ("economic war") in the midst of currency and market turmoil is noteworthy, to say the least. A three-way conference call with China's president Xi would be only fitting. Might as well bring in the Iranians and others. Donald J. Trump - 5:47 AM - 10 Aug 2018: "I have just authorized a doubling of Tariffs on Steel and Aluminum with respect to Turkey as their currency, the Turkish Lira, slides rapidly downward against our very strong Dollar! Aluminum will now be 20% and Steel 50%. Our relations with Turkey are not good at this time!" Those are fighting words. Teetering at the edge, a presidential tweet nudges Turkey over the cliff. I cringed. Leaders around the world surely recoiled. Does President Trump appreciate the consequences and ramifications of a destabilizing currency crisis in a world of lurking financial, economic and geopolitical fragilities? Our President is tough, enthralled with disruption and clearly sending a message. But does he appreciate the extent to which he is playing with fire? The world order is fraying before our eyes - and, for many, the impulse is to revel. Careful what you wish for. I'll assume recent events push forward the move to develop financial and economic institutions outside of the U.S. sphere of influence. In recent years, Putin has surely been preaching to his comrade Xi Jinping that the U.S. is a hostile and untrustworthy rival. At least publicly, Beijing had remained non-aligned, content to foster a non-adversarial relationship with the U.S. Much has changed. The world is now on a trajectory that will shatter pretenses - the façade is being unmasked. Bloomberg Friday headline: "Trump Embraces Market Pain With Little Concern for Contagion." The dollar index gained 1.2% this week to a 13-month high. With Turkey now in full-fledged crisis, the unfolding EM de-risking/de-leveraging dynamic attained important momentum this week. Meanwhile, the U.S. vs. China trade war further escalated. President Trump admitted that playing hardball is "my thing." The Chinese invoked the "American trade blackmail"; "waving the stick of hegemony everywhere"; "playing double-faced tactics" and "mobster mentality" (to name only a few). Perhaps heightened global market instability will have the Trump administration backing down from their hardline approach with China. I seriously doubt that the U.S.'s unilateral actions in dealing with Turkey, Russia and Iran will inspire a softening in Beijing's resolve. Turkey, a nation of 80 million, is a long-time U.S. ally and NATO member. The U.S. Air Force has significant operations at the Incirlik Air Base, and Turkey was a staging ground for major U.S. military operations including the two gulf wars and, more recently, in Syria. I see the unfolding financial, economic and geopolitical crisis in Turkey as an ominous development for a region sliding into an intractable geopolitical maelstrom. Despite Friday's decline, the S&P500 ended the week a little more than 1% below all-time highs. With Treasuries enjoying safe haven demand - and visions of jittery Fed officials glued to Bloomberg screens, longing to conclude rate hikes - there's still little worrying the bulls. But the global backdrop is now in a state of transformation - and not for the better. And on various fronts this became increasingly apparent this week. When I began posting the CBB almost twenty years ago, my focus was on "money" and Credit and the U.S. boom. I didn't anticipate geopolitical developments would some day play a role in my analysis. But I also never contemplated a global Bubble of today's dimensions and characteristics. I never imagined how an explosion of government debt and central bank Credit would be used so recklessly to inflate intertwined Bubbles spanning the globe. Never did I contemplate how this new age global "system" - already highly unstable two decades ago - would be nurtured, backstopped and resuscitated into today's monstrosity. I never could have envisioned how the U.S. would run huge Current Account Deficits for another 20 years and still maintain such command over a dollar-based global financial apparatus. Who would have believed a global financial arms race was even possible - amidst such escalating animosity and hostility? This is a strange period. It's strange here at home - in society, in politics and in the markets. It is strange globally. The unprecedented nature of what we see at home, abroad and in the markets provides a lot of leeway with interpretation and analysis. Somehow, there's a dominant contingent that believes the U.S. is on the right course - that the economic boom will accelerate, markets will, as they always do, continue to rise. The future is bright, all the polarization and social angst notwithstanding. Markets offer unassailable confirmation. It would be great if the optimists were right. But this was a week that corroborated a much darker interpretation of developments. A decade of unrelenting easy "money" and booming finance has masked a metastasis of festering issues - financial, economic, social and geopolitical. And we're now only a more general bursting of the global financial Bubble away from having to simultaneously face a bevy of very serious issues. As they tend to do, developments can seem to move at glacial pace - and then, rather suddenly, they can be more akin to lava. As I have posited repeatedly and expounded in more detail last week, the global Bubble has been pierced at the "periphery." I also believe the backdrop is now conducive to contagion at the "periphery" (finally) gravitating toward the "core." The Turkey-induced risk aversion that erupted this week in European equities (bank shares!) is an important escalation in "Periphery to Core Crisis Dynamics." "Risk off" is gaining a firm foothold, and global financial conditions now tighten by the week. Market pundits expect cooler heads in Ankara and Washington to prevail over the weekend. If not, it could intensify what was already a particularly long and hot summer. I remember when elections were won by leaders selling visions of the future: Harold Wilson’s white heat of technology, Ronald Reagan’s morning in America or Tony Blair’s New Britain. In the new democratic disorder nostalgia has replaced optimism as a ruling emotion. Populists recognise the power of adjusted memory. America’s Donald Trump, British Brexiters, Europe’s new nationalists — they all inhabit a rose-tinted past. Nostalgia’s force lies in a human instinct to screen out the bad while recalling the good. The tendency, I have learnt, becomes more pronounced with advancing years. Hard times become fond moments of shared endeavour and community. With the passage of years, the terrible threat of thermonuclear war can seem like the benign guardian of a stable and peaceful international system. Materially deprived we may have been, but there was something spiritually special about being spared the instant gratification of the digital age. Baby boomers are prime offenders. My most vivid childhood memories are of a world safe for six and seven-year-olds to roam free all day, without an adult in sight, in the urban forest of London’s Richmond Park. Jam sandwiches were feasts. We managed without bottled water. I have to dig deeper into the recesses of memory to recall asking my (Irish) mother about the sign in the window of a seaside boarding house: “No Blacks, No Irish.” The reply — “Oh, pay no attention, they are silly people” — probably hid serious hurt. The 1960s — the swinging sixties — began in Britain with a lecture about morals from a cabinet minister. Homosexuality, Lord Hailsham declared, was an “abnormality” inflicted on young boys by paedophiles. It was “contagious, incurable and self-perpetuating”. Decent sexual behaviour involved only “the complementary physical organs of male and female” — and then exclusively for the purpose of procreation.Today’s nostalgia has become an engine of nationalism. It thrives on the economic and cultural insecurities thrown up by globalisation. Chicken Tikka Masala now counts as a favourite national dish. Yet Britain’s first curry restaurants attracted bitter local protest. They were “smelly”. How could you be sure the lamb was, well, lamb? Nostalgia draws a veil over such prejudice. Blue-collar workers, mostly male and white, were dignified by secure, well paid jobs in the coal mines, steel, or shipbuilding. Easy to forget the grisly fate of the uncles on my father’s side who died prematurely from the miners’ lung disease pneumoconiosis. Today’s nostalgia has become an engine of nationalism. It thrives on the economic and cultural insecurities thrown up by globalisation. We look backwards for a safe identity. No one has been so adroit as Mr Trump in exploiting these emotions. When the US president promises to make America great again, he underlines the “again”. Coal miners head a hierarchy of blue collar heroes embracing metal bashers, auto workers and truck drivers. They are all white. The president’s promise is to take them back — another favourite word — to the glory days of the 1950s. The Brexiters played similar tunes during the referendum campaign on Britain leaving the EU. Theirs was the exceptionalism of English nationalism. The arguments could have been cut and pasted from the Empire loyalists who made sure Britain was unrepresented at the EU’s founding Messina Conference. The clarion call in 2016 was as it had been in 1955 — the illusion of a resurgent “global Britain”. In the former East Germany, the anti-migrant populists of Alternative for Germany sell a still more fanciful reimagining of the past. Ostalgie holds that the communist German Democratic Republic has been libelled. Yes, it may have been repressive, with low living standards, but it offered security, steady employment, and order. The Stasi would not have opened Germany’s borders to Muslim refugees. Hungary’s authoritarian prime minister Viktor Orban stirs the embers of nationalism by lionising his country’s fascist wartime leader Miklos Horthy. The far-right Swedish Democrats, now promising a return to the closed, homogenous Sweden of the 1960s, have roots in that country’s Nazi movement. All the while, security is being re-described as ethnic cohesion. Nostalgia has always had its place in politics. Respect for tradition is at the heart of Burkean conservatism. The deep irony about the now mythologised postwar decades, however, is that these were times when citizens looked unambiguously to the future. Technological advance was seen as progress, liberalism promised emancipation. The age of Sputnik, colour television and The Beatles was all about shedding the past. Its confidence flowed from the embrace of modernity. The emotions were progressive, welcoming of new technology and newcomers alike. And now? A fascinating report by the London-based think-tank Demos observes that recent elections in France and Germany, as well as the British referendum, show the “pervasive extent” to which language that plays up the status, security and simplicity of the past has infiltrated political culture. People who have lost faith in the future are seeking solace in old, imagined, certainties. The lesson for mainstream politicians should be evident. The nationalists will always win when the argument is framed by nostalgia. Progressive politics need a message about the future powerful enough to reclaim the voters’ collective gaze. They could make a start by explaining how to ensure our children are better off than their parents. No need to mince words anymore. 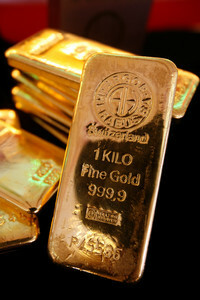 If the futures market still influences gold’s price, then that price is going to spike. And silver is better than gold. Since January, gold futures speculators have been trending from extremely bullish to scared short. And in the week ending last Tuesday (the most recent data available) they appeared to capitulate, adding a massive number of short positions while marginally cutting their longs. They’re now about as close to neutral as they’ve ever been. Based on the history of the past decade this is hugely bullish, since speculators tend to be wrong when they’re fully convinced they’re right. For the commercials – the banks and fabricators who take the other side of speculators’ positions — it’s a mirror image: They’ve been getting less and less short for several months and in the past week took a giant step towards neutral, something that is also historically very bullish. Here’s the same data in graphical form, with the speculators represented by the silver bars and the commercials by the red. Convergence at the middle is both highly unusual and highly bullish for gold. If gold is set to pop, what about silver? Again, if history is any guide gold popping means silver rocketing. The reasons for this are fairly simple. Silver is a surprisingly rare and extremely cheap. Whereas gold is mostly money, which means we save it after we mine it (nearly all the gold ever mined is sitting in vaults and jewelry boxes around the world), silver is both a monetary and an industrial metal. And what’s used for circuit boards, solar panels and the like tends to disappear rather than being recycled. So a big part of each year’s mine production is lost forever. As a result, available stockpiles of silver have been shrinking for decades. Despite this fact, silver has gotten extremely cheap relative to gold lately. About ten times as much silver as gold is mined each year, but today it takes 78 ounces of silver to buy an ounce of gold. That means when the next bull market gets going silver won’t just rise along with gold, it will retrace a big part of the gold/silver ratio between 80 and 10. That means it will rise twice as much in percentage terms as gold. Mining stocks are naturally more volatile than their underlying metals because, as they like to say, they’re “leveraged to the price of the metals.” The junior miners, meanwhile, are hyper-leveraged because of their small size and lack of institutional following, which means if you buy them at the wrong time they fall by 90%. But buy them at the right time and gains of 1000% are common. And there’s more. Even if the whole COT thing turns out to be a dud and precious metals just sit there for another few years, the juniors might still outperform. As the next chart illustrates, big gold discoveries just aren’t coming any more, which means the big miners can’t find enough new reserves to replace what they’re using up. So either way the best juniors will be great investments, soaring in long, beautiful arcs on the backs of gold and silver or in quick spikes when an industry giant buys them out for a nice premium. So sum up, gold is looking great, silver is better than gold, and the junior miners are potentially life-changing. Assuming anyone is still paying attention. HONG KONG – The historian Wang Gungwu recently observed that, whereas the West thinks in terms of ideologies, China has long thought in terms of systems. In today’s age of rapid and profound change – characterized, in particular, by a fundamental shift in America’s attitude toward the rest of the world – China’s system reform approach is being put to the test. Under President Donald Trump, the United States seems to have abandoned its seven-decade-old commitment to the rules-based multilateral order, embracing bilateral deal-making instead, guided by an “America First” agenda. This includes a willingness to make just about any excuse for unilateral action, such as large trade tariffs, against other countries, in order to please domestic constituencies. This approach adds a new layer of uncertainty to any negotiation, not least because the Trump administration’s decision to change the global rules of the game is not particularly promising for the US itself. After all, US-owned companies, which have long extracted the most value from global supply chains, will be the biggest casualties of a trade conflict. Moreover, as the US has discovered during its long history as the world’s biggest market, consumption and soft power go hand in hand. Yet, today, the US faces severe constraints when it comes to stimulating domestic consumption, rooted in factors like massive inequality, fiscal and debt constraints, political polarization, and the imperative to normalize monetary policy. For China, the situation is also challenging, not least because the West now regards virtually all of its domestic policies as geostrategic machinations. But China’s leaders do have the tools to overcome the obstacles ahead. The most important tool is precisely the systemic mindset that has shaped decision-making for millennia, protecting the country’s complex economic, social, and political arrangements from internal corrosion and external threats. Consider the reforms undertaken since 2012. At the Communist Party of China’s 18th National Congress, China’s leaders recognized that the demographic dividend was fading, owing to population aging, and that the “opening up” dividend (arising from increased external trade and investment) was losing value as well. Addressing this challenge required giving the market a more decisive role in resource allocation. After all, according to neoliberal ideology, all other things being equal, the market would naturally optimize economic processes. All the state had to do was ensure that those other things were indeed equal. This demanded, first, the eradication of systemic corruption and, second, structural reforms to address social imbalances that threatened stability and growth. So President Xi Jinping launched an anti-corruption campaign, and the government invested in areas like infrastructure, research and development, technological education and re-skilling, and the social safety net. Such reforms were intended to protect China’s own systemic stability, while contributing to the growth of the entire global system. Unfortunately, China’s efforts are now increasingly being characterized as “mercantilist” and “predatory,” providing an excuse for punitive measures, like Trump’s tariffs. 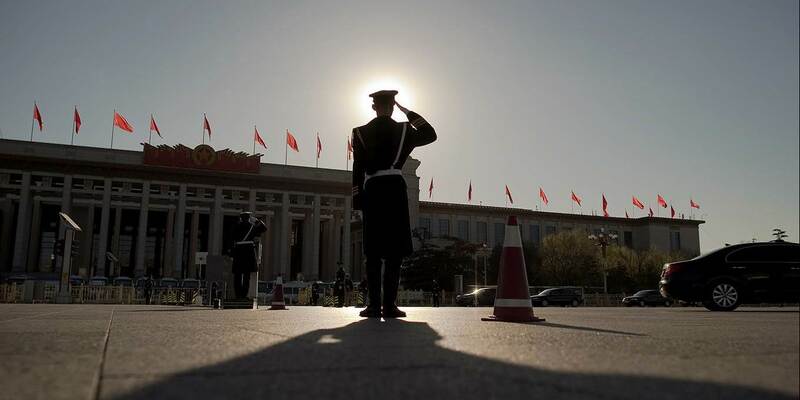 These new external pressures prompted China to adjust its reform momentum in order to reduce its economy’s vulnerability to disruptions in the supply of critical technology, resources, and finance. But China’s adjustment faces a dilemma. A slowdown in reforms may negatively influence the economy and escalate the lose-lose trade war. To withstand the current stress test, China may instead need to accelerate its reforms to reduce internal imbalances, increase consumption, and contribute to global demand and stability. This means eliminating excess capacity, closing down polluting industries, and addressing the large volume of non-performing loans – all while continuing the fight against corruption. It also means tapping the massive consumption potential of China’s internal market, which includes the world’s largest and highest-saving middle class. Critically, because the external trade challenge affects the coastal areas more than the inland areas, structural adjustment policies need to be tailored to accommodate different local conditions. Contrary to the dictates of neoliberal ideology, a one-size-fits-all “best practice” approach cannot bring better results than localized “best fit” policies. This is confirmed by history: globally, the best-performing economies, like the US, Hong Kong, Singapore, and many Scandinavian economies, have been those that adapted universal principles to develop policies that reflect national, regional, and local conditions. This is also true of China during its reform era, where development has been driven largely by local-level policy innovation and gradual adaptation to global standards and rules. Chinese provinces and cities have been empowered to experiment with diverse approaches to development and to adjust bureaucratic structures and government interventions to address local and global market conditions. Competition among fast-growing cities tapping their own comparative advantages – for example, those of Hong Kong and the Greater Bay Area, including Shenzhen, Zhuhai, Guangzhou, Foshan, and Dongguan – has generated system-wide resources in capital stock, income flow, know-how and institutional innovation, which were used to address legacy problems in the less dynamic regions. In this age of complex and dynamic change, China needs to sustain the systemic but localized approach that has enabled its unprecedented growth and development, and that means continuing to promote constant adaptation at the national, provincial, and municipal levels. The one proven systemic response to development challenges has been to allow internal competition across regions and enterprises to boost external competitiveness. That will remain true, no matter how unpredictable US policy becomes. Andrew Sheng, Distinguished Fellow of the Asia Global Institute at the University of Hong Kong and a member of the UNEP Advisory Council on Sustainable Finance, is a former chairman of the Hong Kong Securities and Futures Commission, and is currently an adjunct professor at Tsinghua University in Beijing. His latest book is From Asian to Global Financial Crisis. Xiao Geng, President of the Hong Kong Institution for International Finance, is a professor at Peking University HSBC Business School. Since gaining independence from the Soviet Union in 1991, Belarus has been one of Moscow’s closest allies. The country is a critical part of the buffer between Russia and the rest of Europe. With Russia to its east, EU and NATO members to its west, Ukraine and the Black Sea to its south and the Baltic states to its north, it’s in a strategically valuable position. Moscow needs to keep Belarus squarely within its sphere of influence, and Minsk has for the most part obliged. But when the conflict in Ukraine broke out, things changed. 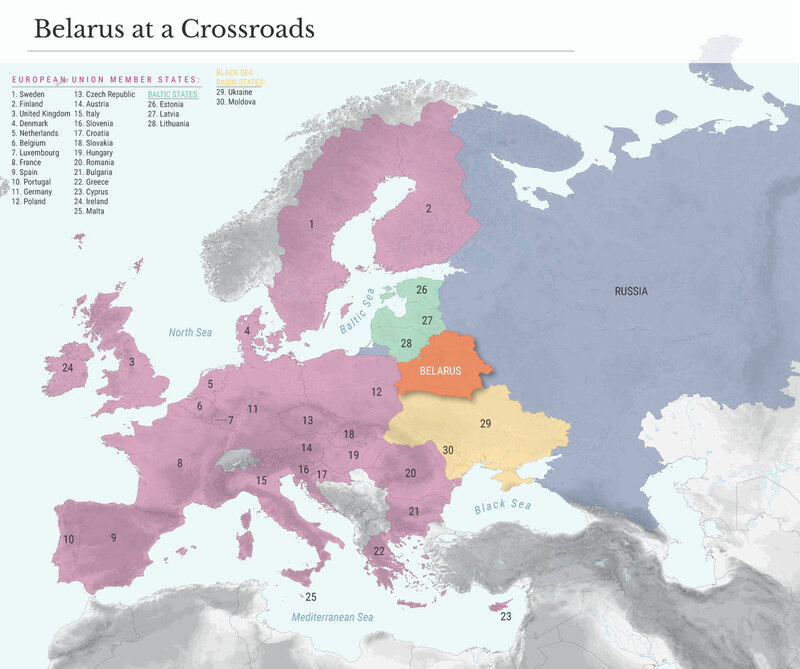 Wary of Russia’s intentions, Belarus started warming up to other potential partners, increasing economic cooperation with China, trying to gain greater access to EU markets, and intensifying military cooperation with the United Kingdom. Still, the two countries have a long history of partnership and cooperation, including as members of an organization called the Union State. Formed in the 1990s, the Union State originally envisioned a fully integrated union between the former Soviet republics. So far, this vision hasn’t been realized, but both countries have signed treaties outlining such a future and theoretically at least are working toward it. Renewed efforts to develop the Union State have been made, to no surprise, just as Belarus has been getting closer to European and Asian countries. Just last month, the presidents of Russia and Belarus attended a meeting of the Supreme State Council of the Union State. But there’s a limit to how integrated these two nations can become. For Belarus, the 1990s were an uncertain time. It was unclear whether Belarus was a viable state without Moscow’s leadership. Its economy was fragile and its institutions immature. It needed support, and many understandably looked to the devil they knew in Russia for financial and political support. Russia was a ready and willing partner. It wanted to demonstrate that it was possible to reintegrate, however informally, the Russian Federation with the other former Soviet republics. Efforts at integration between the two, therefore, began almost immediately after the collapse of the Soviet Unión. It’s from this context that the idea of the Union State emerged. One of its biggest backers, at least initially, was Alexander Lukashenko, Belarus’ first and only president. He believed that the promise of reunification with Russia would calm fears of, and endear him to, those who thought the country couldn’t make it on its own – and there were many. It also gave him some leverage in his negotiations with the Russians. So what is the Union State? In theory, it is a single political and economic entity comprising Russia and Belarus that would share military capabilities, a currency, a legal system and so on. It would also establish a single legislature, a Cabinet and other government bodies, as well as symbols of national unity such as a flag and anthem. But in reality, the Union State has evolved into a kind of alliance on matters ranging from trade and economic development to military coordination. The first precursor to the Union State was the Commonwealth of Belarus and Russia, established in 1996. A year later, it turned into the Union of Belarus and Russia. In 1999, the two countries signed the Treaty on the Creation of a Union State of Russia and Belarus, which created the Supreme State Council, the Council of Ministers and the Permanent Committee of the Union State. The need for a Union Parliament was also established, but it never came to fruition. The union was meant to be modeled after the USSR, and in some superficial ways its architects achieved their purpose. The agreements signed by the two countries state that they would share a common foreign policy, defense and security strategies, monetary and tax systems, budgets and customs policies. Russia and Belarus agreed to a foreign policy agenda for 2018-19 during their meeting in June, and they are part of a common market through their membership in the Eurasian Economic Union. In 2000, the Union State established a budget to fund the programs and projects carried out by the organization as well as the organizational bodies set up by the treaty. Its total budget for 2018 is 6.9 billion rubles ($110.6 million), consisting of 3.2 billion rubles in contributions from Russia and 1.7 billion rubles from Belarus, as well as 2.1 billion rubles in non-tax revenue. Some 4.9 billion rubles will be spent on 34 programs and activities. But many other elements of the union have seen little progress. This is partly because, for Belarus, the need for integration grew weaker as time went on, and the desire for sovereignty grew stronger. The project has also hit some roadblocks along the way. In 2010, relations between Russia and Belarus began to deteriorate. Just two years earlier, Russia invaded Georgia in support of two breakaway regions backed by Moscow. Though Belarus generally supported Russia’s moves there, it was also unnerved by them and so considered improving ties with the West. There were also disputes over economic matters. Russia wanted to decrease oil exports to Belarus and diversify its imports after its markets became saturated with Belarusian goods. But in 2011, tensions started to ease, possibly because Belarus was struggling economically and needed financial support. That year, gross domestic product growth fell to 5.5 percent compared to 7.7 percent in 2010. It reached 1 percent in 2013 and dipped into the negative digits thereafter. The Union State is now very different from what it was intended to be. It provides a framework for cooperation on a multitude of issues, but it allows both countries to maintain their sovereignty where it matters. Integration between Russia and Belarus has focused on two main areas. The first is defense. One of the goals of the Union State is to develop a coordinated defense policy, which explains why the deepest level of coordination has happened on military matters. Both countries are members of the Collective Security Treaty Organization, a group consisting of former Soviet states that requires all members to come to each other’s defense if attacked. Coordination is necessary if they are to deter outside aggression. Russia operates two military facilities in Belarus: the Hantsavichy early warning radar station and the 43rd Communication Center of the Russian navy near Vileika, which transmits orders to Russian submarines. Russia has floated the idea of setting up an air base in Belarus, but so far, Lukashenko has been reluctant. The two countries also coordinate military procedures, provide technical support for each other’s armed forces and cooperate on border issues. They have devised a strategy to coordinate supplies, troops and resources in the event a military threat emerges. They conduct dozens of military exercises every year. In 2017, for example, the Zapad exercises included 12,700 troops from both countries according to Moscow (although external estimates put the number much higher) and were aimed at testing capabilities to respond to external aggression. Another important element of defense coordination is military supplies. During the Soviet era, Belarus (unlike Ukraine, for example) was not a critical part of the USSR’s defense industry, although it was a transport hub and logistics support center for Soviet troops in Eastern Europe. Today, this relationship continues to be one-sided. Some 98 percent of Belarus’ military equipment is supplied by Russia. Russia is dependent on Belarus only for specialist parts produced by the Minsk Tractor Plant used in some mobile military equipment. The other main area in which Belarus and Russia coordinate is the economy. This is the real foundation of the integration project. Like any small state, Belarus has a small domestic market and thus depends on trade to keep its economy running. Exports make up roughly half its GDP. Russia is Belarus’ largest trading partner. Some 43 percent of its exports go to Russia, while 57 percent of its imports come from Russia. 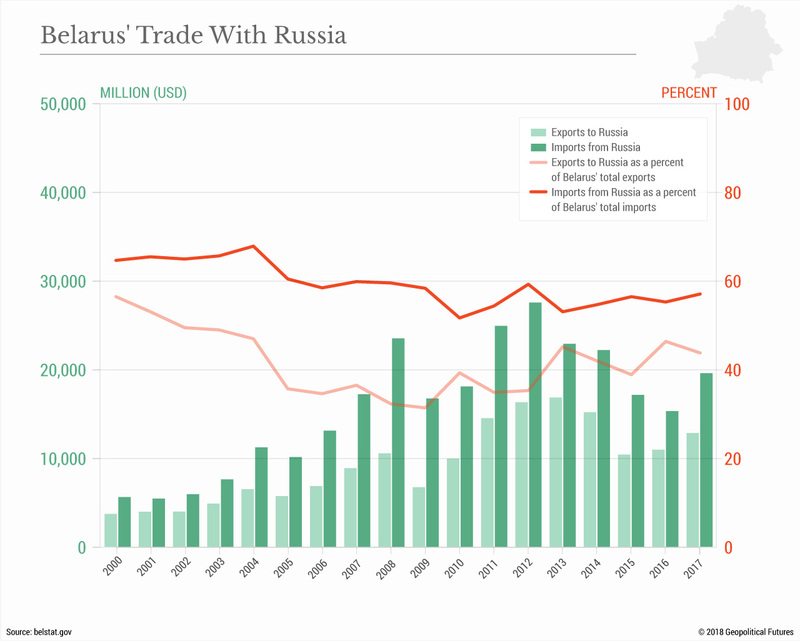 Yet Russia’s share in Belarus’ trade has declined overall since 2000, meaning that although Belarus is still heavily dependent on Russia, it has become less dependent over time. Much of the trade between these two countries is related to the energy sector. Belarus relies on Russia for its energy needs, but it also uses Russian oil and gas to create other products for export. Roughly 30 percent of Belarus’ total exports are oil and gas products, sending about 15 million tons of oil products to Europe alone every year. The problem, however, is that Russian companies don’t have to pay duties on the goods they export to Belarus, thanks to their free trade zone. But when the products are processed in Belarus and then exported to the rest of Europe, companies do have to pay a duty to the Belarusian government. (These re-exported energy products have become particularly attractive as some countries have grown hesitant to do business with Russia.) Russia thus has been considering slashing oil and gas exports to Belarus so that it can make money off the duties itself. 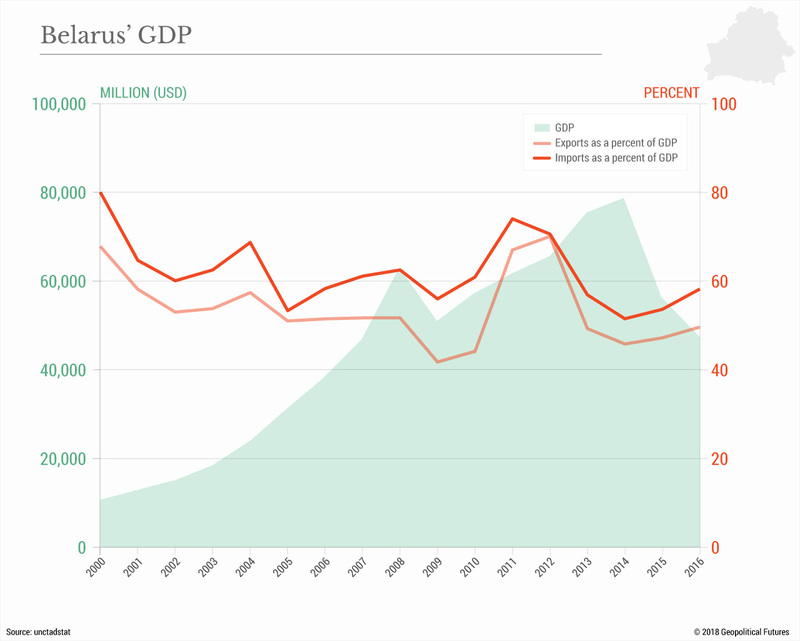 This issue has caused a rift between the two, as any cuts in this trade could create a serious economic downturn in Belarus considering its dependence on oil and gas exports. In the first quarter of 2018, the federal government earned 466.5 million Belarusian rubles ($233.8 million) from duties on oil products, accounting for 8.8 percent of tax revenue. Meanwhile, Belarus is Russia’s fourth-largest export destination and third-largest import supplier. Belarus accounts for less than 6 percent of Russian exports and imports. On a basic level, therefore, Belarus is clearly more dependent on Russia than Russia is on Belarus. Belarus supplies food products, machinery and technical goods to Russia. Companies in Belarus supply components such as electric motors and diesel engines to assembly plants in Russia and also Ukraine. Assembly of some finished products is also carried out in Belarus for export to Russia. Russia is also Belarus’ main investment partner. According to Belarus’ state statistics agency, Belarus attracted $9.7 billion in foreign investments in 2017, more than 38 percent of which came directly from Russia. At the end of 2016, loans from the Russian government and Russian banks totaled $6.61 billion, or 48 percent of Belarus’ external debt. Russia provided Belarus with two state loans totaling $870 million for a period of 10 years in 2015 and another $600 million in 2016. In April 2017, Russia agreed to refinance Belarus’ debt in the amount of $700 million, though this loan has not yet been issued. Clearly, Belarus and Russia are heavily integrated in terms of economics and defense. Still, this does not reach the level of integration that was envisioned with the creation of the Union State. So is the initial vision of the Union State still a possibility? The short answer is probably not for one central reason: Both countries value their sovereignty too much to allow another country to dictate their foreign and domestic policies. They are unlikely, for example, to adopt a single currency or a constitution because this could require serious economic and political reforms that neither is prepared to make. In terms of economic integration, there’s another critical hurdle: Both countries are part of the Eurasian Economic Union, which established a common market between the five member states. In some ways, therefore, the need for the Union State has diminished. And despite the common market, member states still employ protectionist measures and accuse each other of unfair trade practices. Belarus regularly accuses Russia of applying duties on Belarusian goods, setting unfair prices for energy and restricting entry at the border. Carrying out a coordinated foreign policy has also become more difficult. In 2016, Belarus adopted a new defense doctrine that advocates neutrality and states that the country will avoid military conflicts. This is inconsistent with the concept of the Union State, whereby if Russia engages in a conflict, Belarus would be expected to follow. It also states that Belarus will coordinate with multiple parties at the same time. But in a union, Russia may want to restrict Belarus from developing ties with certain nations or groups, particularly NATO. In addition, Russia’s annexation of Crimea has complicated relations between Minsk and Moscow. Belarus was critical of the Russian incursion and hasn’t officially recognized Crimea as part of Russia. Moscow expected support from its neighbor when it imposed sanctions on goods from some Western countries in response to Western-imposed sanctions on Russian goods. Instead, it found that embargoed goods from the EU were illegally making their way to the Russian market through Belarus. Belarus has faced heavy political and diplomatic pressure to side with Moscow on the conflict in Ukraine. Whenever Minsk falls out of line, Moscow threatens to pull some of its economic support or increase its military presence in Belarus. Russia has also tightened controls at the border and deployed operational units of the FSB border guard service there. In February 2017, units from the Federal Customs Service showed up in Belarus. Integration will continue but likely on a situational basis. When it suits the needs of both countries, they will cooperate, but neither wants to commit to a union that might force them to take positions they don’t want to take. Belarus in particular has already seen that integration can turn into dependency, and that can be used as a lever to bend its policies and behavior to Moscow’s benefit. - On Friday, the market witnessed one of the worst currency collapses in recent memory as the lira suffered an outright meltdown. - I have warned about this explicitly for months and what happened this week is "Exhibit A" in why it's important to understand the intersection of geopolitics and markets. - This episode is one for the history books, so I think it's important for me to go through it for my readers on this platform. - This is a comprehensive take with all the usual trenchant analysis and every chart you need to understand it. I thought long and hard about how I wanted to frame this post, and on Saturday morning, I settled on an angle I hope will convey everything I want to convey to readers here in a reasonably concise manner. Readers on this platform often characterize me as a "popular" financial blogger. Some authors on this platform have used that same characterization in their own articles when they mention me favorably or unfavorably, whichever the case may be. Here's a reality check: I am not a "popular" financial blogger. My follower count on this platform is paltry compared to, say, the social media follower counts of even reasonably well known financial reporters from mainstream media outlets. The most "popular" financial bloggers have hundreds of thousands and in some cases millions of followers on Twitter. As far as my own site goes, it's "popular" as far as finance-focused blogs written by one person are concerned, but that's not saying a whole lot. I'm reminded of a friend of mine who's "famous" in the photography world. Just to give you an idea, his second biggest collector is Elton John, but as he often jokes, the words "photographer" and "famous" aren't really compatible outside of Ansel Adams. The irony is, I'd almost invariably be more "popular" if I didn't use the pseudonym. Contrary to what most readers seem to believe, I do not use the nom de plume to attract followers. Ok, so what's the point? Well, the point is, if I were really a "popular" financial blogger, I would have been asked to show up on every mainstream financial media outlet on the planet on Friday morning and maybe even on media outlets that don't generally focus on finance, because I called the collapse of the Turkish lira - full stop. Obviously, the lira's Friday plunge was the biggest story in the financial universe and it catalyzed a bout of risk off sentiment across assets and across markets. Turkey's plight is the most poignant example in recent memory of why it's important to understand the intersection of geopolitics and finance. That intersection is my raison d'être. As the title here suggests, this isn't a case where there's room for interpretation or where it's possible to argue that I didn't provide folks with unequivocally actionable information. I've warned for months on this platform that Turkey was in trouble and I'll give you some examples below, but first let me say that like any good webmaster, I monitor referral traffic on my personal site (i.e., how visitors who don't come in directly end up reading my stuff). In the short history of my site, a sizable amount of that referral traffic has come from this platform, which by definition means that some readers here have read my work over there. Well, I've been writing breathlessly over there about the likelihood of a collapse in the Turkish lira since the beginning of the year and actually, well before that. The bottom line is that the Turkey archive on my site is a veritable museum of bearish lira articles with calls that are as overt as overt gets. I've deployed sarcasm, dark humor, in-depth analysis of the underlying economic fundamentals, exhaustive political commentary, and pretty much every tool at my disposal while pounding the table on this. You are a dark cloud on a sunny day. May Santa leave you an extra lump of coal in your stocking. But while I don't care about the recognition, what I do care about is making sure the relatively small number of readers I do have understand what went on with the lira on Friday, what it portends for markets going forward, and what it says about why it's important to understand markets in the context of geopolitics. I'm going to try and strike a reasonable balance here between rigor and conciseness. Clearly, this is a long and winding tale and I've given you a link to all the analysis and information you could ever want, so I don't feel like I need to hit every possible angle in this post. What I will do, though, is summarize the important events and put them in the context of the broader market discussion. 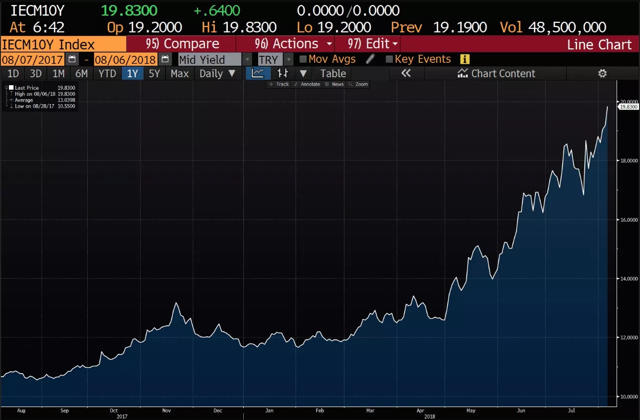 Over the course of 2018, the Turkish lira has depreciated rapidly thanks to idiosyncratic internal factors and a less favorable external backdrop for emerging markets. The idiosyncratic internal factors mostly stem from President Recep Tayyip Erdogan's ongoing quest to consolidate power. Erdogan harbors a set of famously unorthodox views about interest rates, the currency and inflation. Specifically, Erdogan is the self-declared "enemy of interest rates", which he calls "the mother and father of all evil." To be sure, the market is used to that kind of rhetoric from Erdogan, but as inflation started to spiral out of control, his antics acted as gasoline on the fire by reinforcing the notion that the Turkish central bank would be loath to hike rates in order to shore up the flagging currency and arrest the rise in inflation. In case you were under the impression that Erdogan is going to be inclined to moderating his stance on interest rates (which, in his bizarre version of economics, cause inflation if they're too high) he is going out of his way to ratchet up the rhetoric and disabuse you of that idea on a daily basis. "If my people say continue on this path in the elections, I say I will emerge with victory in the fight against this curse of interest rates", he said in Ankara on Friday. You’re reminded that he is saying that amid an acute run on the currency that’s seen the lira make fresh all-time low after fresh all-time low over the past couple of months. It is insane that he would continue to parrot his "I'm the enemy of interest rates" line when the currency is in free fall, especially considering the iron grip he has over the country's institutions (i.e., the central bank isn't really independent). Do you know what Erdogan did this week? He went on Bloomberg TV and all but confirmed that once next month's election is out of the way, he's going to effectively commandeer monetary policy. You can watch that interview for yourself here, but suffice to say it pushed the beleaguered lira to a fresh all-time low and confirmed everyone's worst fears about what's going to happen once he officially consolidates power. I'm going to spare you further examples because I imagine you get the point. Do keep in mind that those comments are from mid-May, when the lira was trading at roughly 4.40. At one point on Friday, it breached 6.80. Key to this story is understanding that to anyone who has followed Erdogan over the years, it was abundantly clear that his April decision to bring forward a landmark election aimed at consolidating power by some 18 months was a decision based on expediency. The lira was already down sharply on the year and it seemed as though he was keen to get the election out of the way in case things got worse. Unfortunately, traders and investors didn't appear to understand that. Rather, the Turkish lira actually rallied on April 18 when Erdogan set the date (June 24) for the elections. The excuse traders cited for that rally (and I just had to hold my tongue when speaking to a few FX traders) was that getting the election over with would "reduce uncertainty". That was true in a sense. The problem, though, was that traders didn't seem to understand what it was that would be "certain" after the election. For one thing, it was "certain" that Erdogan was going to win, one way or another. More importantly, it was "certain" that he would immediately move to effectively commandeer the central bank and as noted above, he said as much (explicitly) on Bloomberg Television in May. Yeah, I could be wrong, but I don’t think this is going to be sufficient. To say that’s debatable would be an understatement and much like Kuroda’s “very powerful” easing has failed to engineer a sustainable rise in Japanese inflation, one imagines CBT’s “powerful” tightening will fail to arrest double-digit inflation in Turkey. Fast forward to June 24 and Erdogan of course prevailed in an election that consolidated his power in a new executive presidency. Having learned absolutely nothing, traders bid up the lira. On July 9, Erdogan installed is son-in-law Berat Albayrak as head of the economy and the reshuffle left no room for market favorite Mehmet Simsek, generally seen as the last bastion of discipline in Erdogan's inner-circle. This is absolutely not what we hoped for. Markets were awaiting the cabinet appointed and the signal is clear: it is not market-friendly, but rather Erdogan-friendly. Somehow, consensus was still betting on a ~100 bps hike from the central bank on July 24 and guess what? It didn't happen. They stayed on hold despite runaway inflation. For traders and, perhaps more importantly, for asset managers, this is just further evidence that Turkish assets are anything but attractive following last month’s election. While EM fund managers will claim to understand all of this, it still feels like there’s a generalized unwillingness to accept the reality of this situation. Accepting idiosyncratic, country-specific risk is part and parcel of investing in emerging markets, but this has gone well beyond that. This is Erdogan–specific risk and he has shown time and again that betting on him to abruptly step out of character and demonstrate some semblance of rationality is fool’s errand. Those latter two demands are tied to the infamous Reza Zarrab case. Zarrab is the former gold trader implicated by the U.S. in a Turkish plot to skirt U.S. sanctions on Iran. Atilla, his co-defendant and a Halkbank employee, was convicted earlier this year for his role in the scheme and sentenced to 32 months in prison in May. According to multiple media reports, the U.S. and Turkey had reached a tentative deal that would have sent Atilla back to Turkey and ensured the Treasury would go easy on Halkbank, in exchange for the release of Brunson. For whatever reason, that fell apart late last month. Yeah. That's trouble right there. So that was the setup for Friday's collapse in the lira. Thursday was rough for the currency, but it started to go further off the rails on Friday in Asia when Japanese traders were stopped out of TRY/JPY positions. That was a repeat of a similar episode on May 23. Well, just after midnight in New York, the Financial Times reported that the ECB is starting to get concerned about the exposure of Banco Bilbao (BBVA), UniCredit (OTCPK:UNCFF) and BNP Paribas (OTCQX:BNPQF) to Turkey. That catalyzed a sharp drop in the euro (FXE) and concurrent rally in the dollar. Hours later, the bottom fell out for the lira, which careened a truly harrowing 13% lower ahead of an expected speech from Erdogan. When Erdogan took the stage in Turkey (around 7:30, New York time) he said precisely the opposite of what the market wanted to hear. Specifically, he railed against higher interest rates, characterized FX volatility as "artificial" and, worst of all, implored Turkish citizens to reach under their "pillows" and trade in their dollars, euros and gold for lira. Erdogan would go on to make a similar speech later, and while he was between rallies, Donald Trump announced on Twitter that the U.S. will double metals tariffs applicable to Turkey. By the cash open on Wall Street, the lira was basically no-bid. The iShares MSCI Turkey ETF (TUR) traded some 1 million shares in the pre-market on Friday, the most ever. In regular trading, the product crashed as much as 22% early on, before paring losses. Still, the vehicle ended up logging its worst week in history. If you invested in this product at the highs in 2018 without understanding the extent to which your investment depended on the evolution of Turkish politics, you are probably scratching your head right about now. More broadly, watch the European banks as a group. The Stoxx 600 banks index was already nursing a 16% loss off this year's highs prior to Friday. I'm not sure the prospect of a European "operation twist" bodes particularly well for margins and the market is still extremely concerned about Italy's fiscal path. 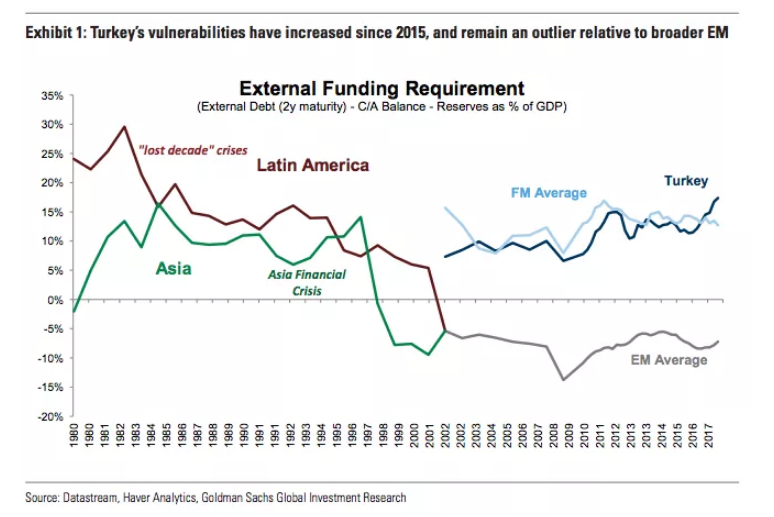 Essentially, Turkey is a frontier market when it comes to its reliance on external funding, so extrapolating to the broader EM complex probably isn't warranted. That said, do keep in mind that this is playing out against an exceptionally unfavorable external backdrop. An unapologetic Fed continues to hike rates and on Friday, the latest CPI data showed core inflation in the U.S. rising at the fastest pace since 2008. In short, Jerome Powell is probably going to keep hiking, which means emerging markets are going to be under pressure. As far as the lira and Turkey in general are concerned, it's now deteriorated to the point where there are basically two options: an IMF bailout or capital controls. We're past the point of no return when it comes to whether a rate hike would work to arrest the slide in the currency. It would probably take a hike of at least 1,000 basis points to make a dent in this. The idea that Erdogan would allow that seems laughable. On Friday evening, Bloomberg reported that banks in Turkey were struggling to meet customer demand for foreign currency. In short, Erdogan needs to do something right now, this weekend, or risk next week being a tipping point. Although the fundamentals in the broader emerging market space are much better than they are in Turkey, you want to keep in mind the Fed (as mentioned above) and also the fact that the U.S. is pursuing a tougher sanctions regime on Russia. The ruble just had a rough week and the threat of sanctions on sovereign debt bodes particularly ill for the country's assets. If Erdogan imposes capital controls, it would almost invariably create a crisis of confidence in emerging markets considering the current environment of a hawkish Fed and an administration in Washington that's increasingly prone to leaning on sanctions and tariffs when it comes to foreign policy. For anyone caught up in this (which, by the way, was everyone on Friday considering how the lira collapse rippled across markets), do remember that this was entirely predictable. And so is what comes next if something doesn't get done over the weekend.